“When it came to my speech drafts,” wrote Clarence Jones, who had already penned the first draft, “King often acted like an interior designer. I would deliver four strong walls and he would use his God-given abilities to furnish the place so it felt like home.” King finished the outline at about midnight and then wrote a draft in longhand. One of his aides who went to King’s suite that night saw words crossed out three or four times. He thought it looked as though King were writing poetry. King went to sleep at about 4 am, giving the text to his aides to print and distribute. The “I have a dream” section was not in it. First of course, he saw a goal, and refused to stray from the path that would lead him there. Second, his leadership was always about reconciliation. He opposed force with love. “Just keep loving them, and they can’t stand it for too long,” he said. Just as he did by publicly forgiving Izola Curry, the woman who stabbed him with a letter-opener in 1958. What a way to run a company or a non-profit that would be, let alone a country. Third, he was a hands-on, involved type of leader. Look at the old photos of King strategizing with his team. He’s down on the ground with them, deeply engaged in their struggles. 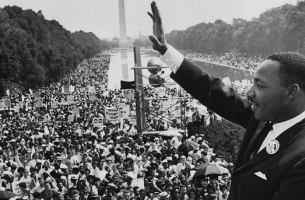 In closing, I have a dream too. It’s a dream of national unity, in a way that MLK would have approved of. My dream is for a new Americanism, where our observable behaviors match our stated beliefs – and where truth is no longer relative – it’s absolute. An American that recognizes the rule of law – where black, brown, white and any other color lives matter – and matter greatly. An America that MLK would have been proud to be a part of – one that celebrates his legacy in action – deeds, not words.